W.P.M.F (World Professional Muay Thai Federation) 1st degree coaching Certificate. and some other international Muay Thai and Kick Boxing events. Some of the fights can be checked in Youtube . MMA Fight Record : 2 Win − 1 Loss − 0 Draw. National Interclub Taekwondo Championship (Gold Medal). 12 years experienced in coaching martial art at different level. Certifield personal trainer from School of Excellence Under California Fitness Jackie Chan's Sports Club, Bass On (ACSM). Certified Boxing Trainer Under (HKBA) Hong Kong Boxing Association. Certified Kickfit Trainer Under California Fitness Jackie Chan's Sports Club (Muay Thai Fitness). Certified Functinal Training Under Fit Innovation. Certified Free Motion Training by Jeremy Strom USA. Certified Vertex or Power Plate Training by Jeremy Strom USA. 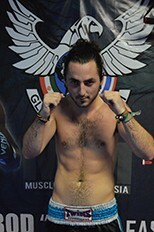 Experience in Sanda, and Muay Thai. Working experience as a Trainer since 2005.